All the places we set foot on today are strong M*slim areas. Sheiks are radicalizing the people and there is stronger resistance to the gospel. Despite the challenges, three house churches are bursting their seams. One crams 60 people into a room about the size of my living room, another is just beginning with 12 adults and 27 children, and yet another has seen 51 new converts in 7 months! They all need a place to worship and expand. They all need bibles. Right outside the door of one of the house churches is a large tree that I will call the worshipped tree. 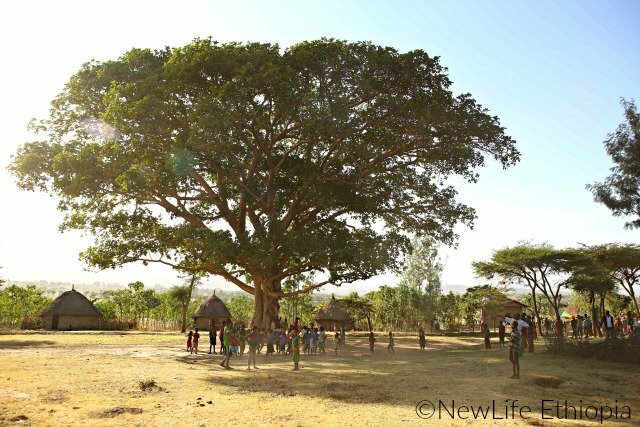 Some in the village believe the tree is a spirit that can do good or bring harm; they appease the spirit tree with food and other offerings. 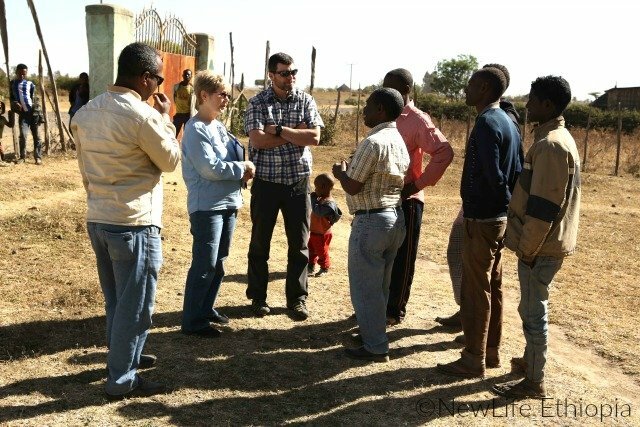 We learned there is a lot of witchcraft and idol worship in and around the villages we are reaching for Christ. 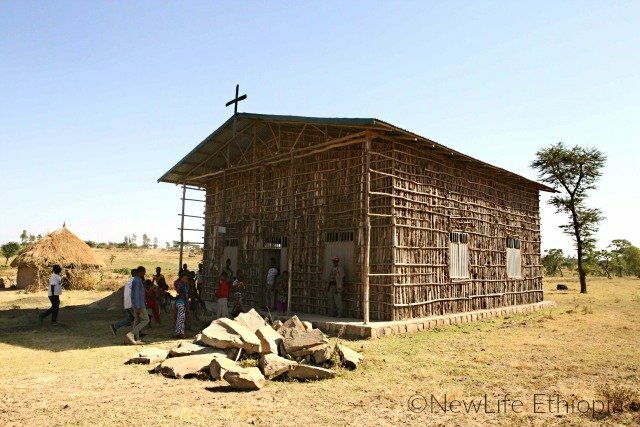 Last year, one church fellowship purchased land and today we were privileged to see a newly constructed church building on it. It still needs mudding, but they have the supplies (dirt, straw and water) and church members will begin the process soon. About 100 people attend this church. We were invited into a M*slim man’s house to pray for his extremely sick son. Our missionary has been witnessing to this man on and off for months. Pastor Zerihun, the man who is over all our evangelism work, boldly shared the gospel with the M*slim man and then prayed for his son’s healing. 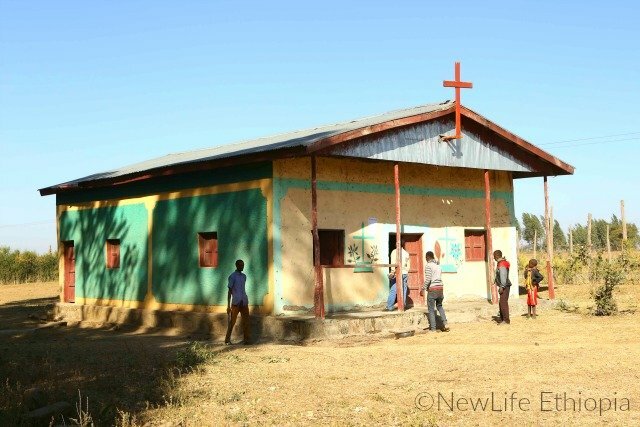 When the boy came out, we could see he was extremely ill. That evening we got a call from the missionary saying the child was completely recovered. We were hoping to hear his father came to Jesus, but his time is not yet. We met three new missionaries sent out by NLE – solid men with a heart for evangelism. We were in several of their homes and I can attest to the fact that without any bells and whistles they are raising their children to fear the Lord and tirelessly tell about Jesus to their neighbors and relatives. 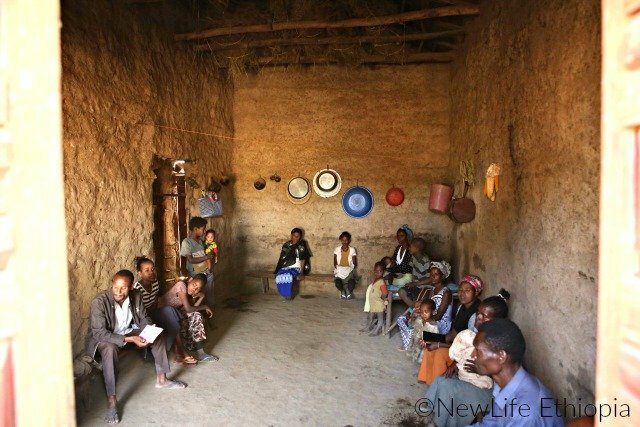 Their houses are usually one room with a curtained off sleeping area, dirt floor and a wooden bench for sitting on. Cooking is done outside. They live as the people around them live… and God has opened doors for them but it has not been easy. In 2018, 4,545 heard the gospel for the first time with 567 committing their lives to Jesus through the witness of NLE missionaries. 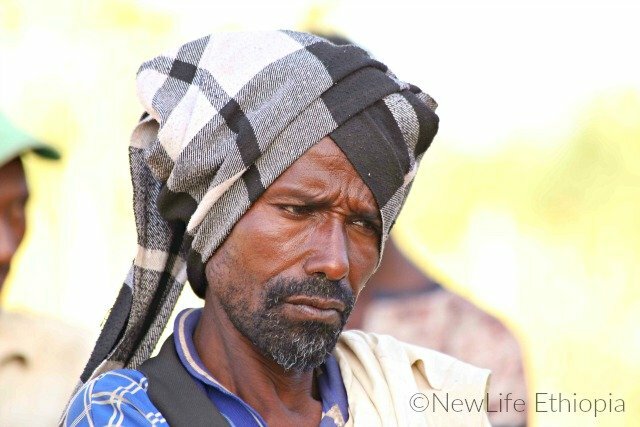 These converts are sold out despite living in hostile environments to Christ-followers. Don’t worry about a single thing but in every situation by prayer and supplication with thanksgiving submit your requests to God and He will keep your hearts and minds in His perfect peace.